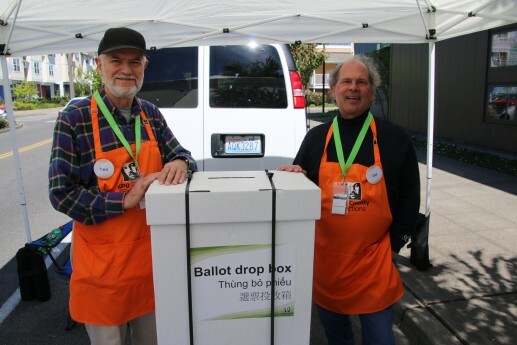 We found Fred and Joe at the ballot-dropoff van outside Greenbridge Library on Monday, and you’ll find the van there from 10 am-8 pm today – your last chance to get the ballots in for the levy to raise money to replace the area’s emergency-radio system. In the first of its nine years, the rate will be 7 cents for every thousand dollars of property valuation, so if you have a house valued at $400,000, this will cost you $28. If you’re mailing your ballot, remember you need to provide a stamp, and get it postmarked by tonight; if you use the drop van (or another county dropoff spot), you do NOT need a stamp.